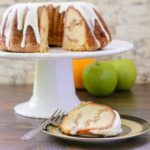 A recipe for a bundt cake made with apples, browned butter, cinnamon and a touch of orange juice. The cake is drizzled with a browned butter glaze. Preheat the oven to 325 degrees F. Grease and flour a 10- or 12-cup bundt pan. In a small skillet (stainless steel recommended), melt butter over medium heat. Continue to cook until it turns light amber in color. Watch carefully and do not burn. Pour browned butter through a fine mesh sieve into a measuring cup. Add enough oil to make 1 cup. Set aside. In a medium bowl, add flour, baking poweder, and salt. Whisk to combine and set aside. Peel, core, and chop apples into small pieces. Place the chopped apples in a large bowl. Sprinkle with 3 tablespoons sugar and 1 teaspoon cinnamon. Stir to coat apples with sugar and cinnamon. Set aside. In a large bowl, add the remaining 2 cups of sugar and butter/oil mixture. Using an electric mixer on high speed, beat for 2 minutes to combine. Add the orange juice and vanilla and beat to combine. Add the flour mixture and beat on medium speed until smooth and combined. Do not over-mix. Pour one third of the batter into the prepared bundt pan and spread evenly. Spread one half of the apples evenly over the batter. Repeat layers. Top with remaining batter and spread to cover the apples. Bake for 1 hour or until a cake tester or toothpick inserted into the center of the cake comes out clean. Cool cake in the pan for 15 mintues. Remove cake from pan and cool completely on a wire rack. In a small skillet (stainless steel recommended), melt butter over medium heat. Continue to cook until it turns light amber in color. Watch carefully and do not burn. Pour browned butter through a fine mesh sieve into a small bowl. Set aside to cool to room temperature. Add the confectioners sugar to the bowl with the browned butter. Add the half-and-half 1 tablespoon at a time, stirring to combine until smooth. Add more half-and-half if needed to get to desired consistency for drizzling on cake.